These monumental bronze panels are handcrafted using painstaking techniques at the Milan-based studio of Gianluca Pacchioni. Although part of the Tropical Fossil series, each panel features unique bas-relief elements formed from leaves and plants grown in the garden of Pacchioni's studio. ‘You have the sensation that the plants are floating in a bath of gold mud, while the other side is blank and smooth, focused on the classification of patinas,’ Pacchioni says. ‘There are two souls in every panel'. Materials and finishes Wood structure covered with liquid bronze and hand-rubbed brass patina. Solid brass frame. Unusual English four-panelled screen. Oak framing with decorative frette work of stylized flowers crowned by carved scroll top piece. 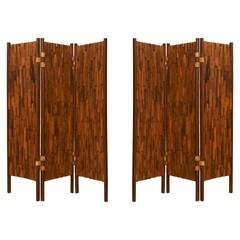 Each panel: 83" H x 33" W.
Four panel bent bamboo screen in a white painted finish with chinoiserie designs, circa 1950s. 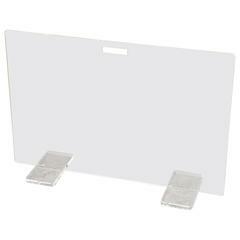 The screen consist of two parts with two panels each. Can be mounted as doors. 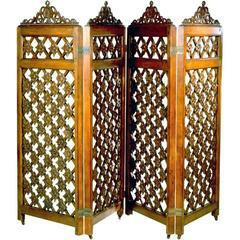 Four-paneled wrought iron screen with intricate scrollwork throughout, circa early 20th century.